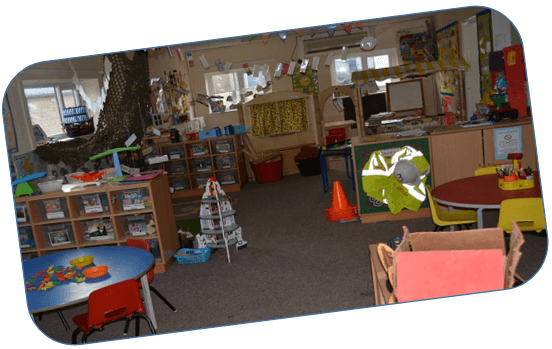 This is the room where the children aged 3-4 are and the routine becomes more structured as they get ready to move to big school. If your child has been with us since they were a baby, or have attended toddler room then they will automatically move into this room when your child’s key worker feels your child is ready, this may be a little before or a little after their 3rd birthday but regular half hour visits will have taken place before the decision to move them up is made. Once a bond is made with the preschool team and new relationships have formed with new children then the key worker system continues and your child’s learning journal will be passed over in order for development and learning to continue at the appropriate level. Parents will have the opportunity to meet your child’s key worker and talk about what the room entails. In the pre-school room the day becomes structured as they carry out similarities of big school, these involve register time with encouraged self-registration, table time with academic activities such as writing, spelling and pronunciation, and planned activities relating to current topics such as seasons or recent events, e.g new baby etc. We encourage independence as much as possible in all areas especially personal care, support is given when needed and other children give just as much encouragement. We offer various areas of play to enhance learning and development under guidance using the Early Years Foundation Stage development matters, as children learn best through play.